Sunday morning, 7 December 2014, in Tacloban Public Market Leyte Province, Philippines, after Typhoon Hagupit made landfall. As a weakened Typhoon Hagupit continues to sweep across the Philippines, United Nations agencies are quickly responding to the needs of the local population by providing critical life-saving supplies, the Organization announced today as it also applauded the Filipino Government for its swift and efficient first-response efforts which, it said, had saved many lives. Hagupit made landfall over the weekend battering the Philippines’ Dolores municipality with high winds and lashing rains, resurrecting fears of a repeat of the devastation caused by last year’s Typhoon Haiyan. As the weekend progressed, however, the slow-moving typhoon was downgraded to a tropical storm amid moderate to heavy rains, according to the UN Office for the Coordination of Humanitarian Affairs (OCHA) in its latest situation report. Nonetheless, OCHA added, an estimated 1 million people remained in 687 evacuation centres throughout the country. 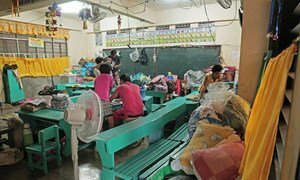 The agency added that it had strategically prepositioned supplies in warehouses in Tacloban, Manila and Cotabato, including water kits, hygiene kits, water pumps, generators, water storage and treatment facilities as well as nutritional therapeutic food items to combat malnutrition, oral rehydration salts and tarpaulins power for at least 12,000 families. Although the full extent of the damage continues to remain unclear in certain provinces due to poor communication, the number of reported casualties appears to be relatively low with media sources citing 21 deaths compared to the more than 6,000 killed by Typhoon Haiyan. “UNISDR believes that the Philippines government has done an excellent job of putting into action the lessons learned from Typhoon Haiyan,” declared UNISDR head, Margareta Wahlström. The United World Food Programme (WFP) announced today that it is “working flat-out” to support the Philippines Government's humanitarian response to Typhoon Hagupit which could impact more than 30 million people.